We all see the beautiful windows on websites, magazine and in adverts – where rooms are perfectly proportioned and windows are the ideal size and shape for the room. They look stunning and really simple to achieve. But in real life it’s not always the case, and dressing your windows to their best can often be very tricky.There might be radiators in the way, a pipe running nearby, lack of wall space, or a bright bright light outside, all of which are little hurdles to overcome to create the right living space. I’ve recently completed a project where the windows were fundamental in making the room work. The room had a beautiful view of the garden and benefited from a fantastic large window to showcase this. However, it also felt a little cold, and lacked being a room in it’s own right. We needed to furnish the room, whilst also making sure that nothing retracted from the view. In addition to this, there was limited space on either side of the window and with such a large window the stack back (amount the curtains pull back to) was going to be large and really start to encroach on the view. So, what did we do? Well we used a layered technique for the made to measure curtains. The top layer held the heavier curtains, which were made to a set width and just used to frame the window and add warmth to the room. These can’t be pulled, so we could specify how wide to make them so they sat in the right proportion for the window. 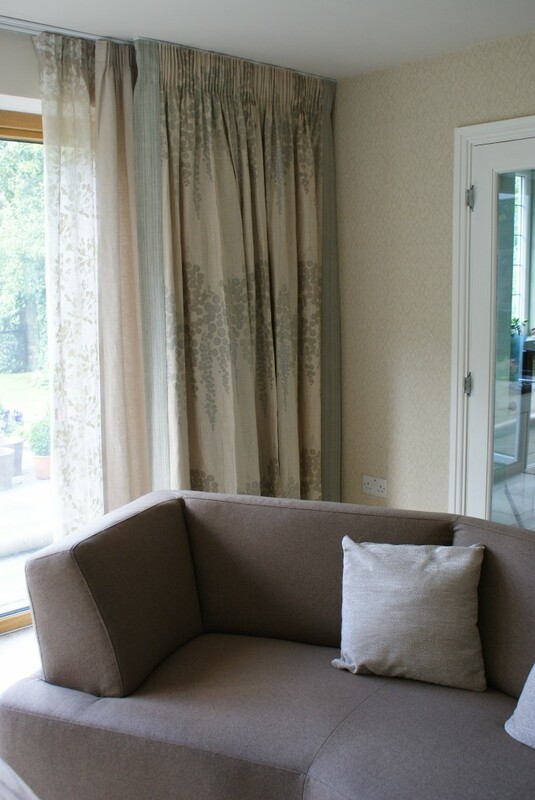 The gorgeous Mark Alexander fabric, in a soft linen, was just perfect for the room. Calming and subtle, it echoed the colours of the garden outside with a pattern than enhanced the view rather than competing with it. 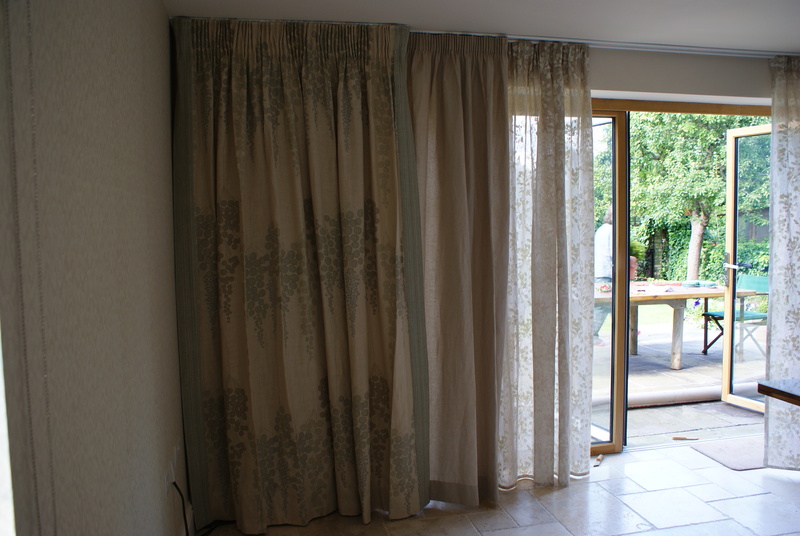 We added a border to the horizontal edges of the curtains to add drama and definition, and to introduce a little more colour in to the room. The second layer was a fantastic voile from Romo. 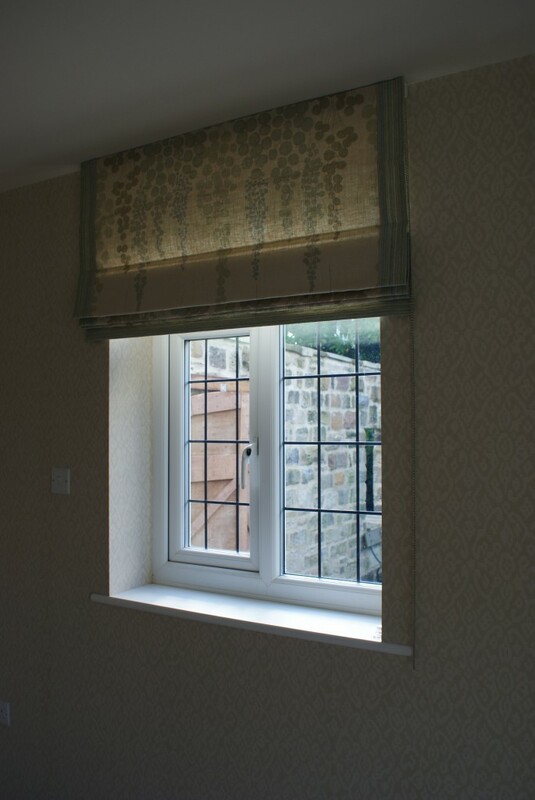 Printed with a modern floral design, it gives privacy without blocking out too much light. 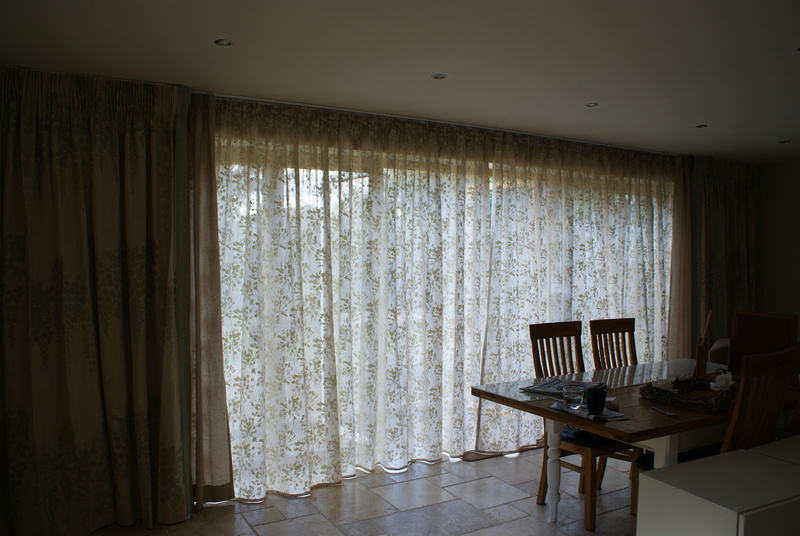 The voile can be pulled on days when some protection from the sun is needed, or on summer evenings when you just need a little bit of covering on the window. Lastly, a wide width fabric from Osborne and Little completed the look. Lightweight so it doesn’t take up too much room when stacked back, but with a closed weave, this fabric is the one that closes out everything behind – perfect when the weather is not so great. To enhance the curtains further, we chose a wallpaper again from Mark Alexander’s range, which adds pattern across the walls without becoming over bearing, and made a roman blind to match the curtains for the small side window. Overall, we were completely thrilled with the result, as was our client, Linda, who had this to say: “Just wanted… to say how much we love the room. Bill was initially “shellshocked” by the transformation…and in the evening with glass in hand he wandered round saying “I really like this” – so job well done!”.